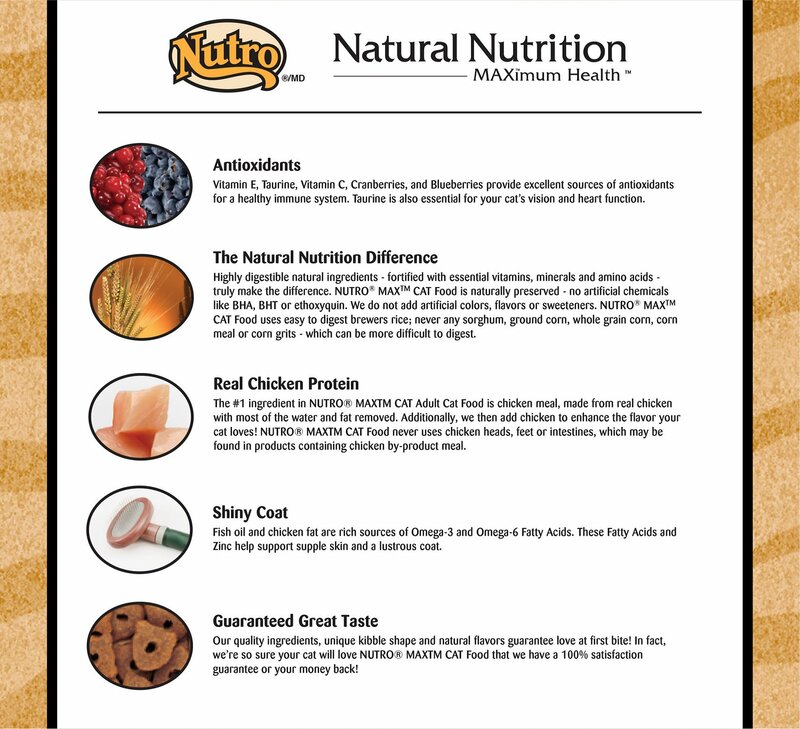 Give your kitty the nutrition he craves and thrives on with the Nutro Max Adult Roasted Chicken Flavor Dry Cat Food. Made with chicken as the first ingredient, it packs plenty of animal-sourced protein to fuel all those indoor adventures. The formula is loaded with antioxidants for a healthy immune system, essential taurine for vision and heart health, omegas for a shiny coat, and a balanced blend of vitamins and minerals. Plus, it’s formulated with a kitty-approved flavor and kibble shape that’ll have your pal running to his bowl every time. 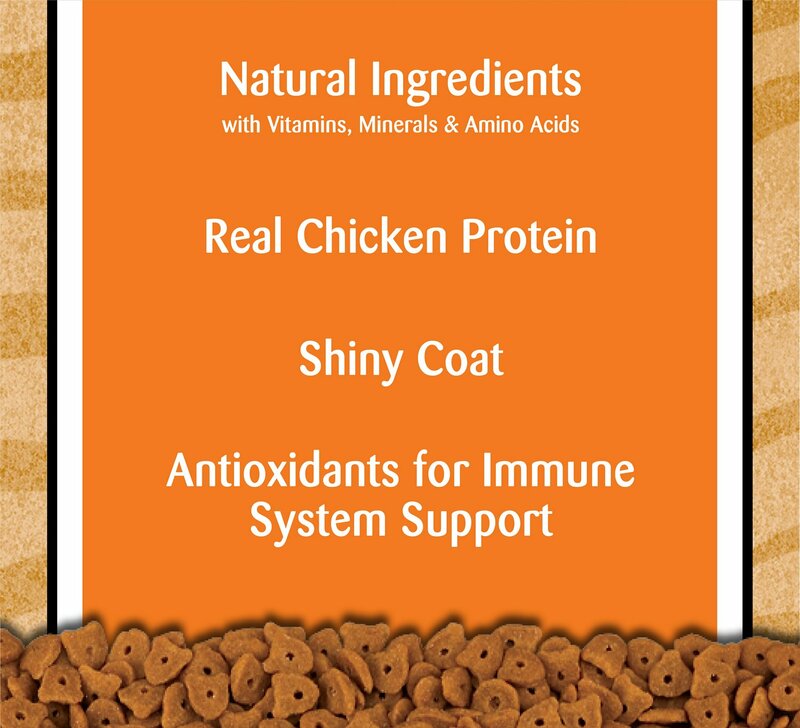 Adult kibble formula is made with chicken as the first ingredient for the high-quality animal protein cats need. 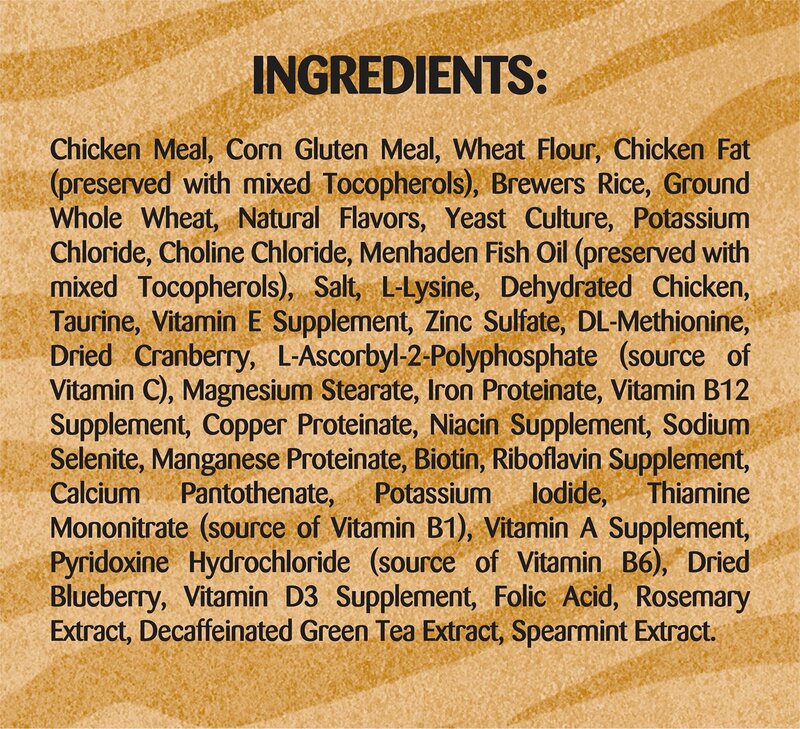 Chicken Meal, Corn Gluten Meal, Wheat Flour, Chicken Fat (Preserved with Mixed Tocopherols), Brewers Rice, Ground Whole Wheat, Natural Flavors, Yeast Culture, Potassium Chloride, Choline Chloride, Menhaden Fish Oil (Preserved with Mixed Tocopherols), Salt, L-Lysine, Dehydrated Chicken, Taurine, Vitamin E Supplement, Zinc Sulfate, Dl-Methionine, Dried Cranberry, L-Ascorbyl-2-Polyphosphate (Source of Vitamin C), Magnesium Stearate, Iron Proteinate, Vitamin B12 Supplement, Copper Proteinate, Niacin Supplement, Sodium Selenite, Manganese Proteinate, Biotin, Riboflavin Supplement, Calcium Pantothenate, Potassium Iodide, Thiamine Mononitrate (Source of Vitamin B1), Vitamin A Supplement, Pyridoxine Hydrochloride (Source of Vitamin B6), Dried Blueberry, Vitamin D3 Supplement, Folic Acid, Rosemary Extract, Decaffeinated Green Tea Extract, Spearmint Extract. 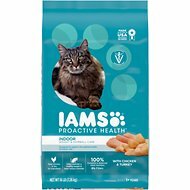 My cat is a very picky eater and will ONLY eat this food. Ive always had a hard time finding it in stores, and the few stores I found it in no longer carry the product. So I've tried other foods that people said are similar, but my cat won't touch it. I'm very happy that I found this on chewy.com for a great price and with fast free shipping! Kitty is also a happy customer! I have really tried to get the kitties to eat better. Unfortunately they give me the attitude "you first." We can all agree on Nutro Max (them, not me). Thankfully Chewy carries it, because its impossible to find locally anymore. Having a large cat rescue/sanctuary the food is the biggest financial budget buster. 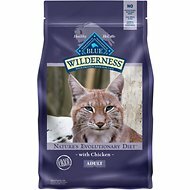 Having to recently switch brands and stay in a realistic money belt with good nutrition, I found Nutro Max Cat and thought I'd give it a try. Wow! In eight years, this brand is the cat's meow. They don't leave a crumb, literally. There was also no food transition tummy issues and an extra boost of energy even with the seniors! Finally, a solution to brand hopping. Will stay with this! Finding a dry cat food that all ten of our rescue cats enjoy is a task! I was thrilled when the vote from the gang came back a solid “ YES MOM- WE LOVE IT! !” Will continue to purchase! 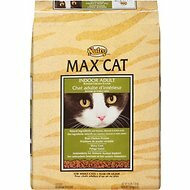 I've used this cat food for many, many years. Keeps my cats healthy and they clean it all up every day. I have buying Nutro cat food for years.Who remembers how long.My order arrived faster than expected. Good product for a reasonable price. My cats like it, however, they turn their nose at the salmon flavor.